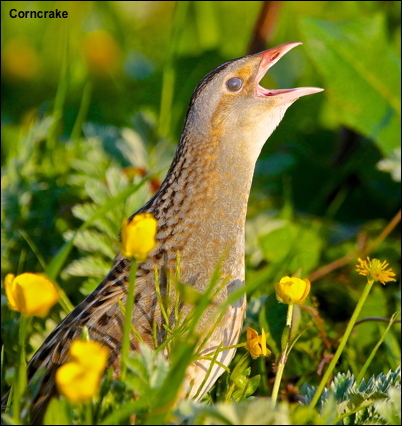 This weeks blog and gallery is dominated by one of Islay special birds, the Corncrake. Twenty years ago there were only eight calling birds and the future of the summer visitor looks bleak. Scottish Natural Heritage stepped in with various grant monies and brought this bird back from the brink to more than one hundred calling birds. Sadly these grants have now been withdrawn and the Corncrake is now in freefall with perhaps their numbers being halved this summer. Ironically Islay’s big money-earner is its Whiskey and this success may now be working against the Corncrake. Previously many of Islay’s fields lay fallow in summer and proved good for Corncrakes. Now they are ploughed and sowed with Barley which is of little value to the Corncrakes. If this iconic bird is not to disappear completely it may once again need a helping hand.